Stephanie is therapeutic musician, certified drum circle facilitator, composer, and performer. She is also a co-found of Music for Life of Pittsburgh, LLC, which provides music for every facet of life. She graduated in 2008 as a Certified Music Practitioner from the Music for Healing and Transition Program. As a CMP she provides bedside therapeutic harp music for patients in various Pittsburgh hospitals including the Children’s hospital of Pittsburgh and The Heinze Campus VA Hospital. She also has volunteered as a CMP at the Magee Women’s Hospital and Forbes Hospice, as well provided music for several UPMC events. 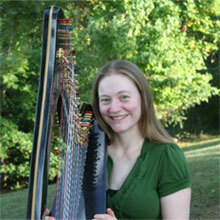 In 2009, Stephanie completed her training with Sarajane Williams, MA, VAHT, as a Vibroacoustic Harp Therapy Practitioner. Vibroacoustic Harp Therapy (VAHT), is a unique method of utilizing the vibrations of live harp music to help bring one’s body back into balance. During this process harp’s natural vibrations are harnessed through amplification and channeled directly into a mat which has embedded speakers. Every piece that is played is tailored to the client’s individual needs. The vibrations from this personalized music can penetrate areas in which hands are unable to go, helping to restoring the body’s own natural rhythms for health and well-being. The sensation of the vibrations moving through the body is often described as a musical massage. VAHT is beneficial for relieving pain, stress and anxiety, and it has virtually no side effects, making it an effective complimentary therapy to use in conjunction with traditional approaches. Currently, Stephanie is offering Vibroacoustic Harp Therapy sessions at Green Heiress Holistic Health on Wednesday afternoons and evenings. Sessions vary in length from 30 to 60 minutes. For more information please visit www.musicforlifepgh.com. To schedule a Vibroacoustic Harp Therapy appointment please email Stephanie at stephanie@musicforlifepgh.com.